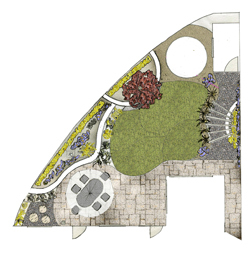 We offer a completely personalised garden design service. It is ideal for new gardens and re-design of established gardens. We consider all your lifestyle needs, budgetary constraints and gardening capabilities. We design with these requirements in mind. We can present you with various possibilities on the layout of your garden while also giving you options that will fit to varying budgets. If you are undecided as regards what to do with your garden and you need some expert advice you can avail of our Free Consultation Service. Free Consultation Service. We will visit your garden to discuss your ideas and requirements, whether it is for a full garden design or just a small area. We will look at the overall layout and can give provisional advice on design, materials and planting. We will undertake a full garden survey taking into account all dimensions and characteristics of your garden. This will be used to produce an overall outline of your garden. This in turn forms the basis for which we can begin to draw up our master plan. 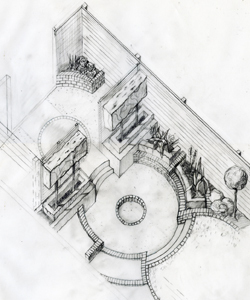 We will produce preliminary sketch plans and concepts showing the proposed scheme for your garden. It is at this stage that we begin to fine-tune the design with you, using one or more ideas from the plans provided. When we feel that the client is satisfied with a scheme we will proceed to the final stage. After the client has agreed on the final working plan we will set out a time frame for construction. Once this has been agreed we can proceed to the building stage.